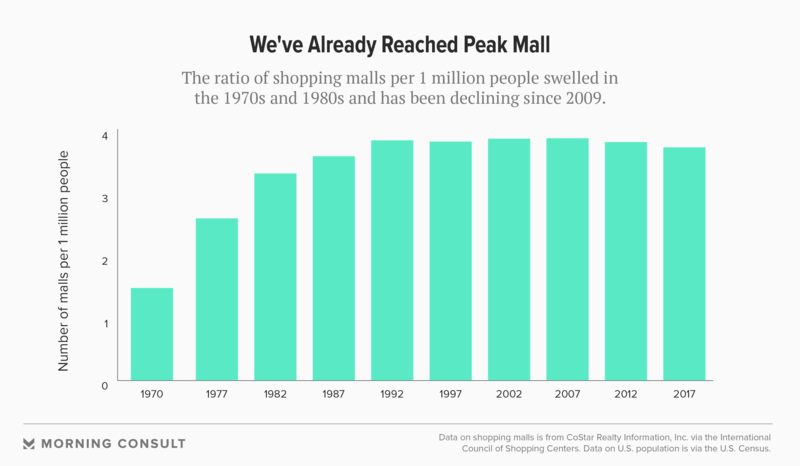 The number of U.S. malls quadrupled from 300 in 1970 to 1,202 in 2017. During that same period, the U.S. population grew from 203 million to 325.7 million. For years, many analysts in the retail and commercial real estate sector have predicted the death of U.S. shopping malls. But a closer look at recent industry data shows that despite sweeping closures and thinning foot traffic, malls are far from dead. While recent reports paint a gloomy outlook — an April report from Cowen and Co. predicted that as many as 20 percent of stores at some mass and middle-market mall retailers will close in the next five years, and a Credit Suisse report from May forecast that 25 percent of all U.S. malls could shutter by 2022 — those projections don’t portend the imminent death of malls, according to other industry experts who say it’s more that the industry is correcting itself in a country that built too many retail centers over the past few decades. And as consumer expectations of the retail experience are shifting, many malls are finding new life by returning to their roots as community hubs. When the first fully enclosed, climate-controlled mall in the United States opened in 1956 in the Minneapolis suburb of Edina, the two-level, 74-store Southdale Center mall featured a center court that was envisioned by architect Victor Gruen as a type of town square, in addition to European architectural elements like arcades and gallerias, according to the Minnesota Historical Society. Malls were “creatures of the ‘60s and ‘70s,” a new phenomenon that baby boomers and their parents happily flocked to as safe, clean community spaces compared to dilapidating downtown centers, said Hughes. The growth of malls was powered in part by suburban expansion and the purchasing power of its residents, according to Hughes. But the rise of big-box stores like Walmart Inc., along with the increasingly tight schedules of baby boomers as they became parents, weakened the leisurely appeal of malls, he said. Experts also pointed to Amazon.com Inc. and the fast growth of online retail as other key reasons for the decline in the allure of shopping malls. While online sales accounted for 9.1 percent of U.S. retail sales in the third quarter of 2017, the industry grew 15.5 percent compared with the same period in 2016, outpacing the 4.3 percent rise in overall retail sales, according to Commerce Department figures. But big-box stores, busy schedules and online shopping aren’t killing malls, according to experts, who say the wave of closures is essentially a market correction. “What we’re seeing now is a natural evolution of malls,” said Richard Feinberg, a professor at Purdue University’s Department of Consumer Science, in a Jan. 31 interview. The number of malls quadrupled from 300 in 1970 to 1,202 in 2017, International Council of Shopping Centers data shows. During that same time period, the U.S. population expanded at a slower pace — from 203 million to 325.5 million. “We were way over-stored; we were way over-malled,” said Feinberg. At least 8,640 mall stores shuttered last year, a record high since Credit Suisse began tracking such data in 2000. Per capita retail square footage is also too high, Feinberg said. U.S. square footage was 23.5 in 2015, compared with 2.4 square feet in Germany and 16.4 in Canada, according to the Cowen report. But despite those figures, most malls are doing quite well, according to Feinberg, whose academic work on the topic dates back to the 1980s. Simon Property Group Inc., the largest shopping mall operator in the United States, reported $571.1 million in profit for the fourth quarter of last year, compared to $394.4 million in the same period of 2016. Its revenue stayed the same, at $1.42 billion, for each of those quarters, and its occupancy slid to 95.6 percent from 96.8 percent. Occupancy rates nationwide have ebbed since the early aughts, according to National Council of Real Estate Investment Fiduciaries data provided by the International Council of Shopping Centers. In 2007, occupancy was at 94.4 percent before falling to 89.2 percent in 2010 and then climbing back to 93.1 percent last year. Simon Property owns five of the top 10 most valuable malls based on total asset value, according to a January ranking compiled by CNBC and research firm Boenning & Scattergood. Most of the malls on that list are “Class A” malls, which refer to their high levels of productivity and the quality of their tenants, according to Feinberg. While Class A malls are thriving, Classes B, C and D are the most at risk, according to the Cowen report. The two lowest tiers comprise 30 percent of all U.S. shopping malls. Class A malls also tend to be destination properties, offering more than retail. That, Hughes said, is where many malls have gone wrong — they have focused too much on the retail aspect of their business while ignoring the consumer experience. Monthly foot traffic is down at least 3 percent on a year-over-year basis, according to a July report from the data intelligence firm Thasos Group Inc., which gathered data from 98 percent of Class A, B and C malls across the country from November 2016 through May 2017. “Retail is not dying, but what shoppers want to experience is changing,” said Taylor Coyne, a senior research analyst at Jones Lang LaSalle Inc., in a Jan. 30 interview. Coyne said many malls are renovating in four key ways: improving or adding food, beverage and entertainment options; creating more community-oriented spaces and adding mixed-use areas; investing in aesthetic upgrades or name changes; and converting to non-retail uses. 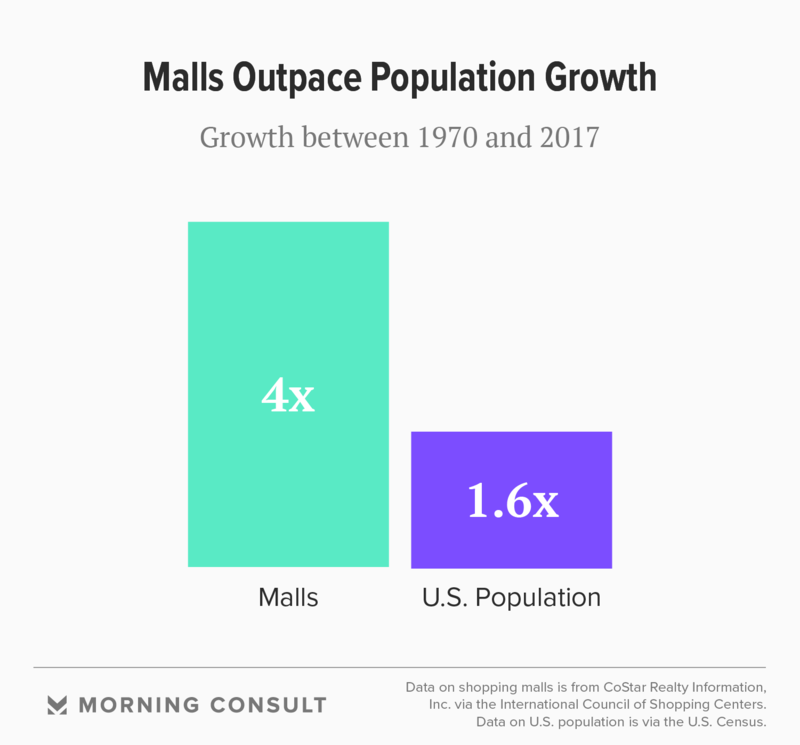 Some are even removing the word “mall” from their name in an effort to shed the image of outdated shopping spaces from the last century, JLL noted in a November research report. Instead, owners are using words like “shoppes,” “towne center” and “village” to create the image of a close-knit community. The Shops at Foothills in Fort Collins, Colo., is an example of the evolution of those retail spaces, down to the name. After General Growth Properties Inc., the owner of the Foothills Fashion Mall, filed for bankruptcy in 2009, Alberta Development Partners invested $313 million into a total redesign for the northern Colorado mall: a $5.8 million recreation center; rooftop patios for gathering; an open space for concerts during the summer and an ice rink during the winter; and new dining options. Many malls are aiming to re-create “idealized old downtowns,” said Hughes, with a combination of retail, hotel and residential uses and spaces. Indeed, malls that were anchored with grocery stores, community centers or venues carrying consumer staples had more foot traffic than those with traditional department stores as anchors, said a July report from Thasos. A Morning Consult survey found that most adults said cheaper retail prices (73 percent), more and improved food options (58 percent) and renovated movie theaters (51 percent) would make them more likely to visit shopping malls. Less enticing features are luxury experiences like valet parking and spas (25 percent) and a VIP shoppers lounge area (25 percent) similar to the Westfield Corp. and Uber Technologies Inc. partnership announced in August. The nationwide poll was conducted among 2,201 U.S. adults from Feb. 1-4 and has a margin of error of plus or minus 2 percentage points. A separate Morning Consult survey found that consumers have a complicated relationship with malls. Fifty-nine percent of respondents said they sometimes shop at non-strip malls, but 54 percent said they shop at malls less often than they did five years ago. That survey — conducted Jan. 25-26 among 2,202 U.S. adults, with a 2 point margin of error — also found that 59 percent of consumers said they don’t think malls will be popular shopping destinations 10 years from now. Some industry experts disagree with that prediction. “Malls will remain relevant,” said Alexander Goldfarb, a managing director of equity research at the investment banking firm Sandler O’Neill and Partners, in a Jan. 31 interview. “Are they going to look the same as today? No, in the same way that the productive centers of today don’t look like what they looked like 20 or 40 years ago,” he said.